There’s been a lot of talk about how long the protein craze can maintain momentum. 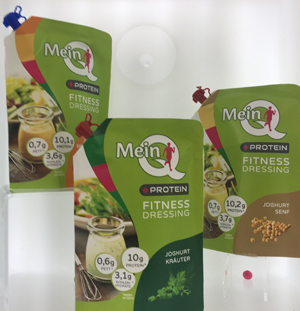 Many in the health and wellness space are preparing for the protein story to change direction, with buzz words such as refuel and weight management changing to total fitness and healthful lifestyle. Historically the term fit has been associated with exercise and clothing size. But over the years, consumers have come to embrace a more holistic definition, one that includes both the mind and body, and with the latter not dictated by dress size or number on the bathroom scale. The dairy industry is so vested in the refueling and weight management platforms that many have failed to notice the shift in how other foods, and food ingredients, are positioning themselves to this evolving consumer who values total fitness and healthful lifestyle. It’s about choosing the right foods to not only help one build muscle, improve endurance and speedup recovery, but also to assist with fighting inflammation, staving off fatigue, improving sleep, reducing signs of aging and more. Protein remains part of the picture. In fact, it’s a critical part of a food’s story. It’s the approach to marketing protein content that is changing. The line includes MyQ Fitness Drink. Sold in four-packs of shot-style 100-milliliter drinks, each bottle contains 10 gram of protein. Initial flavors are strawberry and vanilla. There’s a line of refrigerated yogurt dressings in Mango-Chili, Yoghurt and Yoghurt Mustard varieties. There is also new MyQ Fitness Pudding in chocolate and vanilla flavors. The puddings are low-carb, low-fat and high in protein, with a 100-gram serving providing 10-grams of protein. Lastly, the company debuted what it calls MyQ Fitness Base. With a consistency of yogurt, this thick, creamy, unflavored high-protein dairy product can be used in cooking, with cereal or blended with fruit and whole grains. In the U.S., to support its growing ready-to-drink (RTD) beverage business, Arizona-based Shamrock Farms is unveiling new branding and packaging to be used across all its RTD products, which currently are distributed to more than 50,000 quick service restaurants and upwards of 40,000 grocery and c-store outlets nationwide. The company tapped award-winning packaging and brand design firm Flood Creative to lead the effort. Flood is well-known for its work for entrepreneurial RTD beverages, including Fuze, Body Armor and Core Hydration. The team built the new branding based on research showing a tremendous opportunity to leverage the Shamrock Farms name to reach a mainstream audience. An updated Shamrock Farms logo now sits in a field of vibrant green on top of all Shamrock Farms RTD products, unifying the brand while connoting the pure, fresh and healthy Shamrock Farms milk inside. The new PET bottle is slightly indented on the sides making it easy to grip and hold on-the-go for an active lifestyle. The new look is debuting with the Rockin’ Refuel protein-fortified milk line, which is renaming to Rockin’ Protein in order to bring the number-one product benefit--protein for active people--to the forefront. On the new Rockin’ Protein bottle, new graphics spotlight appetite appeal and delicious taste, while showcasing protein content and flavor variety. Meanwhile, the new Cold Brew Coffee and Milk bottle will now feature graphics to showcase the blend of pure, fresh Shamrock Farms milk and Colombian coffee inside. It’s all about energizing and fighting off fatigue. “The new design system allows each product line to showcase their individual benefits whilst unifying them quite literally under an umbrella of freshness, purity and quality,” says Paula Grant Flood Creative founder. In addition to the new RTD bottles for Rockin’ Protein, the brand is issuing its first-ever limited-edition bottle in support of the U.S. Ski and Snowboard team and its partner athletes. The bottles feature red, white and blue graphics along with images of snowboarding and skiing, and feature the new name Rockin’ Protein. This limited-time offering will be available December to March. Chobani’s vision of universal wellness builds on the company’s founding mission to provide better food for more people. The company plans to invest in: nutritional wellness to provide better food for more people; social wellness to increase investment in the communities it serves and the people who craft Chobani foods; and environmental wellness to build a supply chain that ensures the planet’s health. To bring this vision to life for consumers, Chobani is launching an evolution of the brand’s creative expression—Fighting for Happily Ever After—which is shaping everything from the brand’s packaging, website and campaigns to its cafés and more. Chobani’s in-house creative team spent more than a year developing the evolved brand look and feel. This evolution differentiates the brand at shelf and reflects the values of the company. The new creative will be supported by a robust integrated campaign to inform and educate consumers, including online video, shopper marketing, social and public relations programs. In February, the brand is planning a major commemoration of its 10th anniversary, including activations for fans and initiatives focused on strengthening communities. This wellness positioning includes new products that will be featured soon as a Daily Dose of Dairy. The time is now to communicate the role of dairy protein in fitness and well-being.